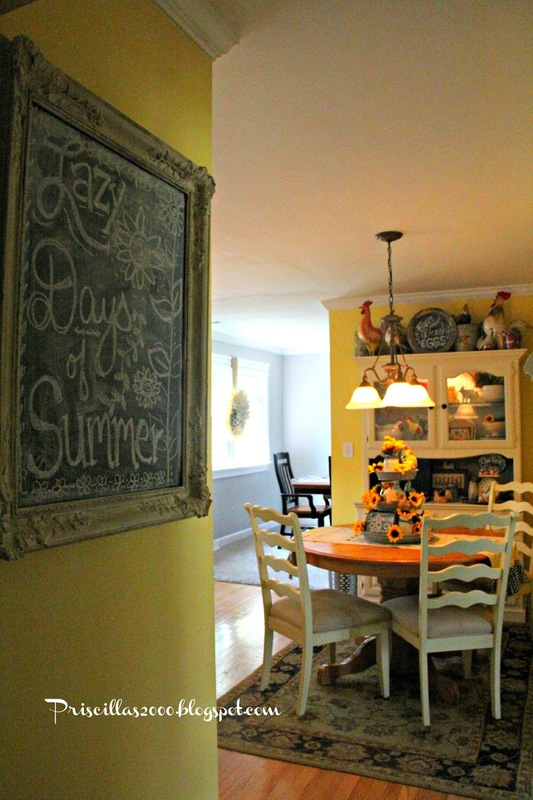 I redid the seasonal chalkboard I have in the kitchen to a sunflower theme.. 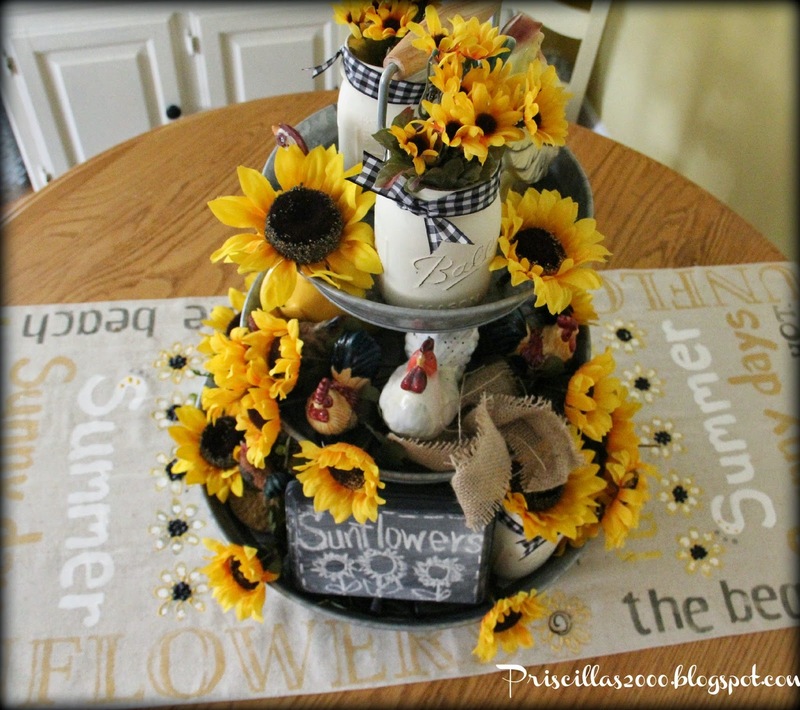 I also did the galvanized tray I got from Sam's club with sunflowers ..lots of chickens and some more of the painted mason jars...Its sitting on the stamped table runner I made last year .. There is always a basket of fresh vegetables on the counter this time of year .. and of course a mason jar full of my favorite zinnias ! 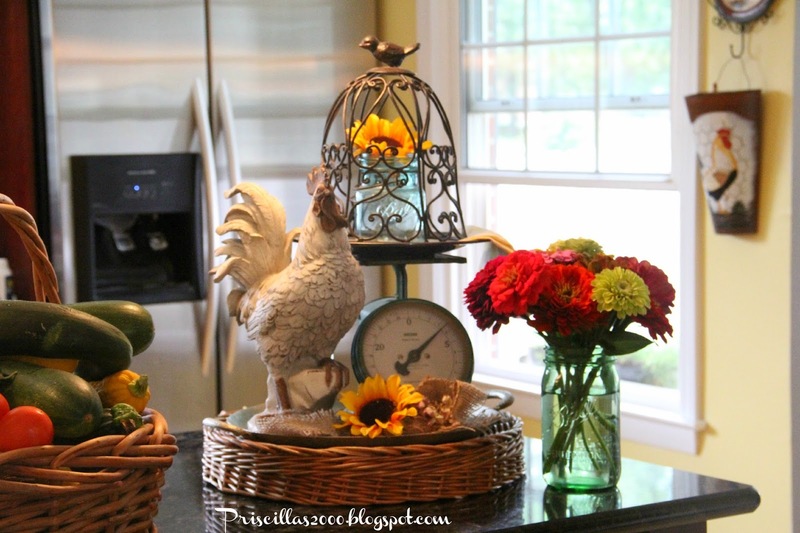 Love this vignette on my counter with an upside down basket tray from Goodwill with a vintage scale , mason jars and of course a chicken ! 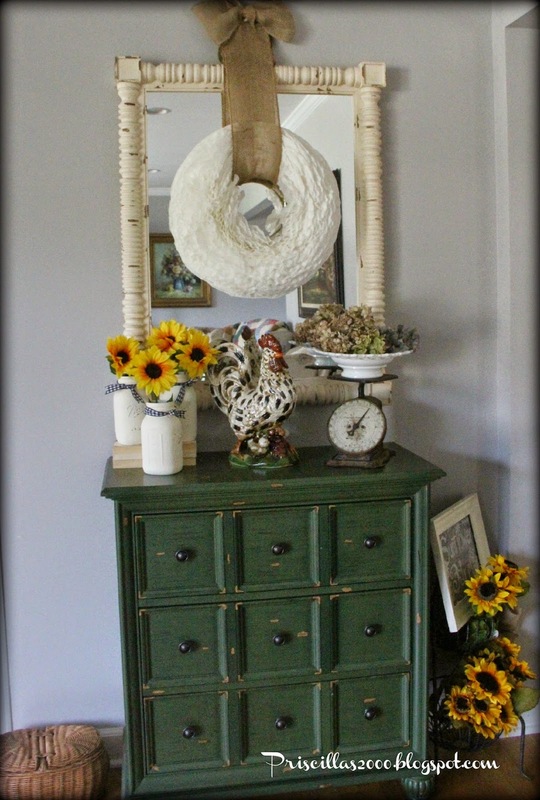 Still loving the galvanized tiered tray , and I can't wait to fill it with pumpkins and other fall goodies !! Except I don't want summer to be over ! These are the zinnias I picked yesterday that are in the mason jar .. so many flowers blooming ..I love this time of year ! 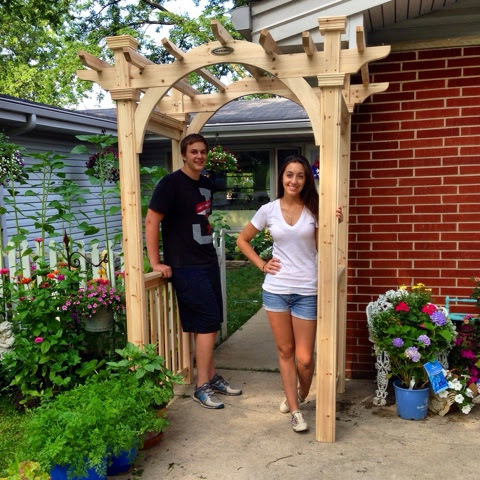 My youngest son helped my daughter build this arbor for her yard.. It is going in the backyard but we need more help to get it back there ! It only took them a few hours.. Thanks as always for stopping by, and your nice comments !! Have a great Thursday ! So pretty, as always Priscilla! I am dreaming of Fall here. I am even beginning to bring out some of my Fall quilts and things. Still hot, and very much summer, but a girl can hope. 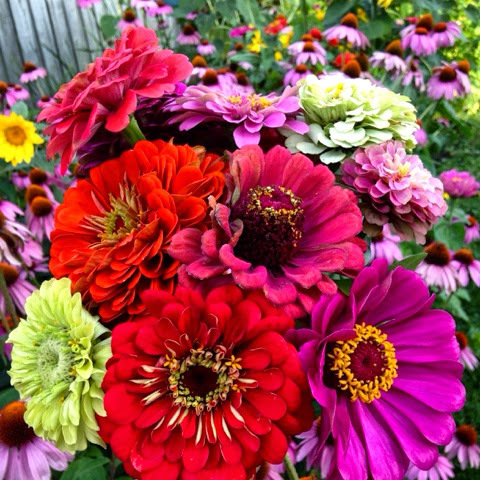 Your zinnias are gorgeous. I have planted only a small area, but they are so pretty. That arbor that i the kids made is beautiful. Chelsea will get many years of enjoyment out of that! Her house is darling. I wish she would blog! 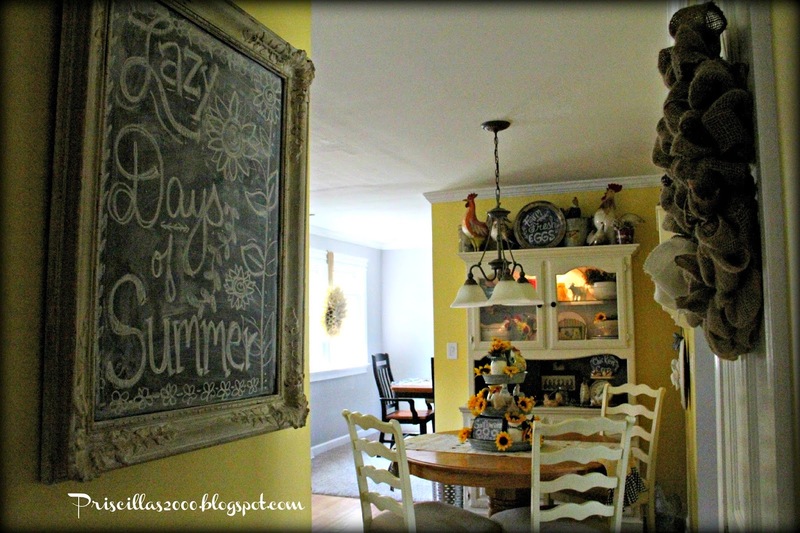 I love the decorating with the sunflowers. Both your garden and the arbor look wonderful. What a nice picture of your family! 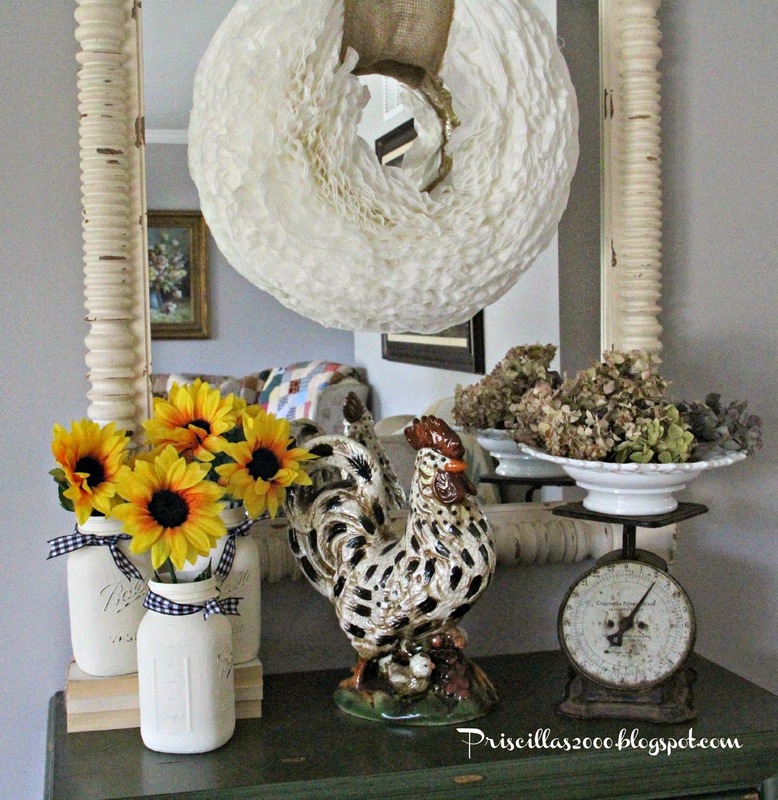 Love the sunflower vignettes..There is something about yellow , black and a rooster together that appeals to my heart strings!! I love your flowery creations. Laughed when I saw you and I have many of the same things you used to decorate with. I'm going to be your newest follower so I can see your great ideas often. 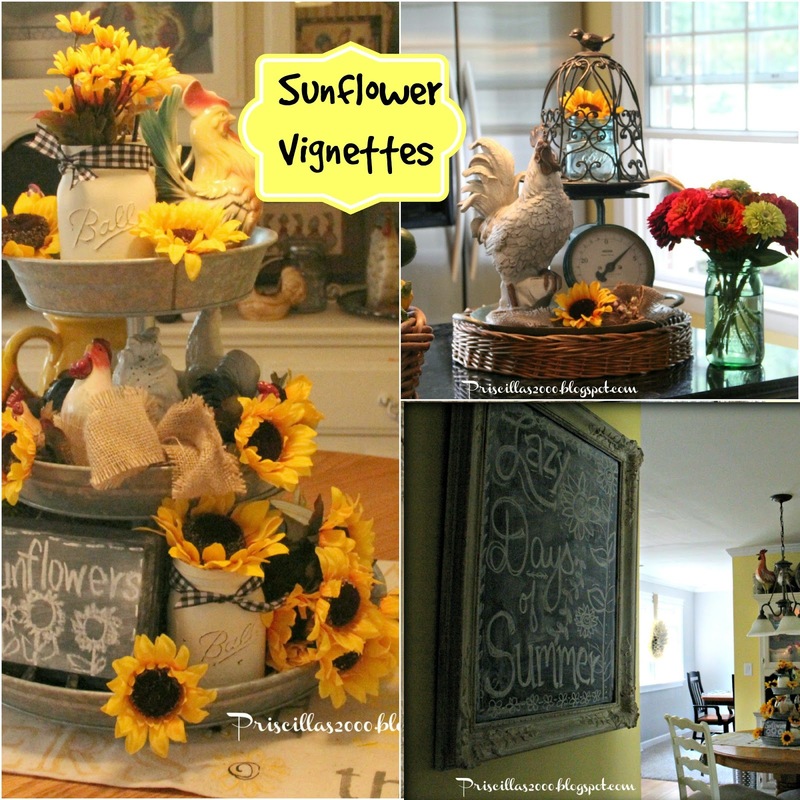 I am loving the sunflowers and they remind me that fall is just around the corner! So pretty and cheerful! 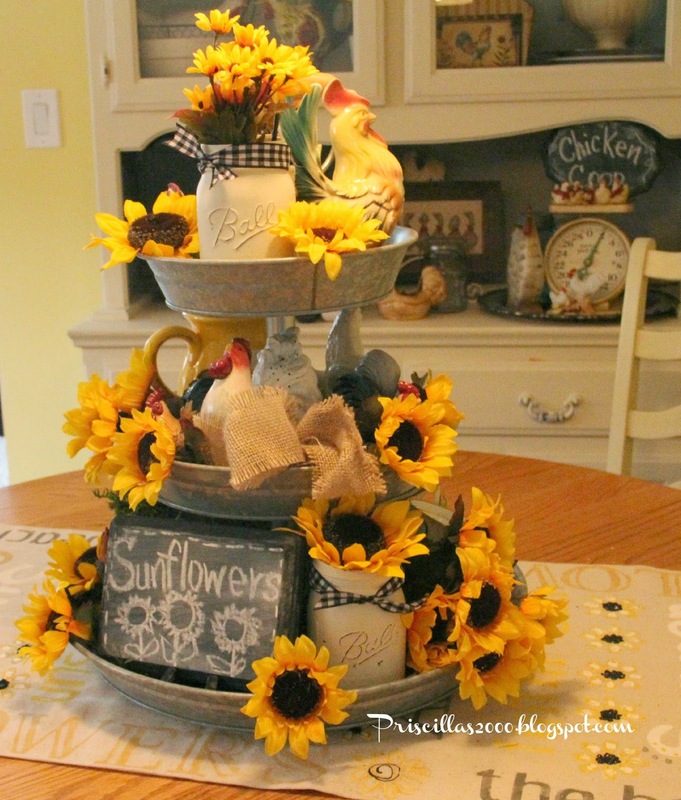 Love all the sunflowers- especially the galvanized tiered tray! 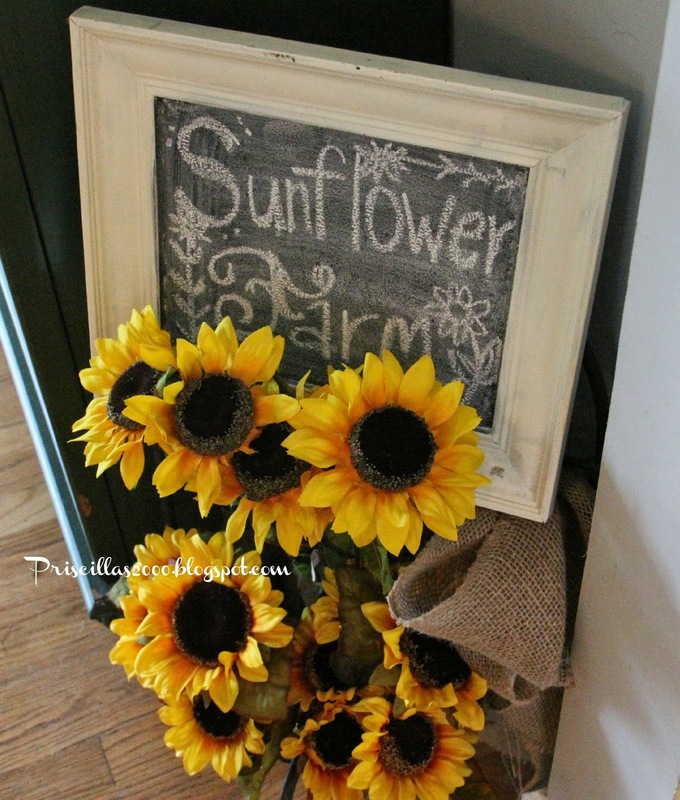 Sunflowers are a nice transition before fall! your vignettes are so pretty. I love the sun flowers. Hi Priscilla, you got me with "sunflowers", I love everything bout what you have done! So much so, I am featuring them in my Weekend Party. Hope you can come see what I have written over at Oh My Heartsie Girl!! Love your sunny sunflowers Priscilla! I have quite a few on display now also. Great transition from Summer to Fall. I'm like you and don't want summer to end. 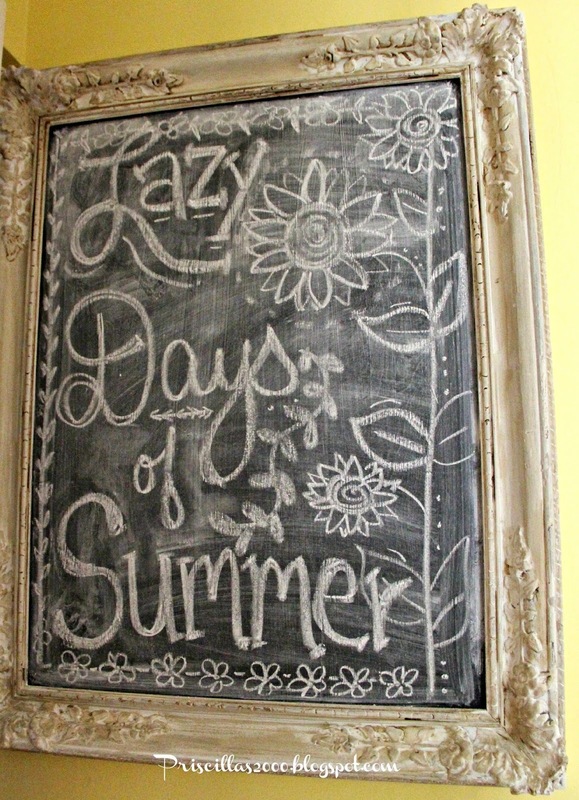 I love that tray and your chalkboard art is always fabulous! Love your daughters new arbor also. Thanks for sharing with SYC.